There is enough people with this issue that make me think there may be something to this. At the same time not every one is having an issue. If you are having issues you first need to email verizon and in that email you need to post your average signal strength. I recommend you get 5 days of data so you can get a good average. Please in your email do not post that you have "1 or 2 bars" of 4g. Bars do not mean anything and if they think its just issues with bars they will just raise them. You need to go into settings, about phone, signal strength and put your average dBm in the email. (example: I average betwwn -110dBm to -130dBm). Providing them with physical data will help them more with testing than emailing about how many bars you have. After you emailed vzw then you can post your anger here. If you did not email vzw then crying and moaning is just wasting everyone's time. The 10 mins it take you to type an angry post could be used to send an informed email to vzw so they can build up some concrete data to better help the see how big of a problem this is and better know how to correct it. So please if you have reception problems make sure you email vzw your data so technicians can get a better feel of the issue. Thanks and Hang in there we waited all this time to finally get our nexus and we are not gonna just give it up with out a fight so fight on. Oh and the first dev that beats vzw to the punch and provide us with a fix I have $20 I can throw in to your donation bin, sorry if 20 isnt enough but its the holidays. rayhodge02, 1nF3rn0, grapthar and 1 others like this. 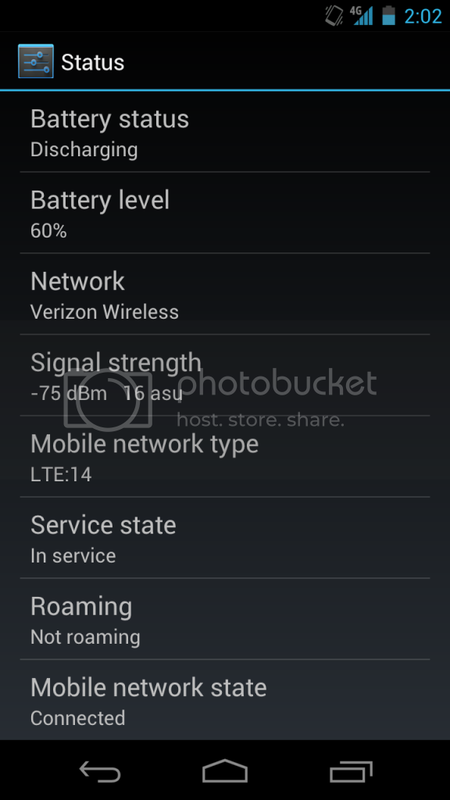 I'm not so sure that it's the phone, maybe it's Verizon's network, or Android 4.0, or the Radio Drivers ? While my signal strength is usually -10dBm worse than other 4g phones in side by side comparison, When I ahve 4 bars (which is most of the time) my signal strength and speeds are generally like this. Went for a 200 mile trip yesterday, in and out of 4g coverage and it switched to 3G and back to 4G just fine. It is the phone. My real world use tells me so. I also have a Bionic, which is famous for data connectivity issues. In all the areas I frequent the Bionic would never have connection issues where the Gnex does. Never had an issue with the Bionic not being able to connect to data after coming off of wifi. Never had an issue with the Bionic being able to pull a strong 3G signal when in CDMA only. 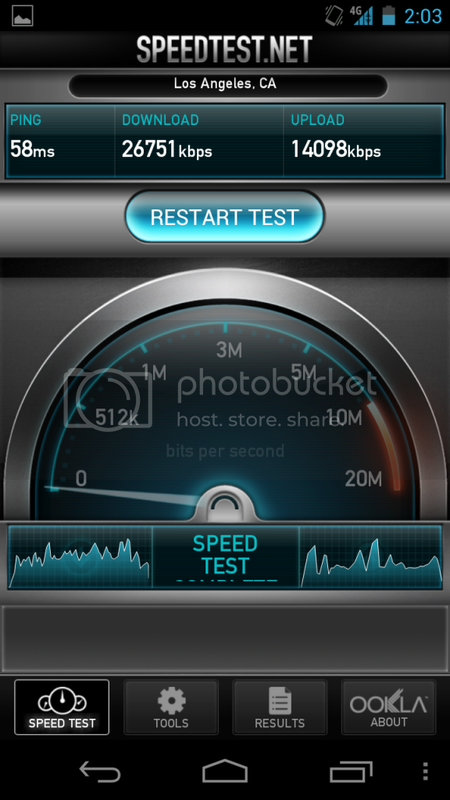 Never had an issue with the Bionic switching from 3G to 4G quickly. The only thing I do not have an issue with the Gnex is getting strong 4G in LTE areas. My issues are all more CDMA related. And that is where the majority of my use is. Do you think it's Hardware or Software ? If honestly wish I knew. That makes 2 of us. I am hoping it isnt hardware but we really need vzw to put out a true fix so we can find out. Raising the bars is not an acceptable fix. Can someone be kind and tell me how to read the signal strength?